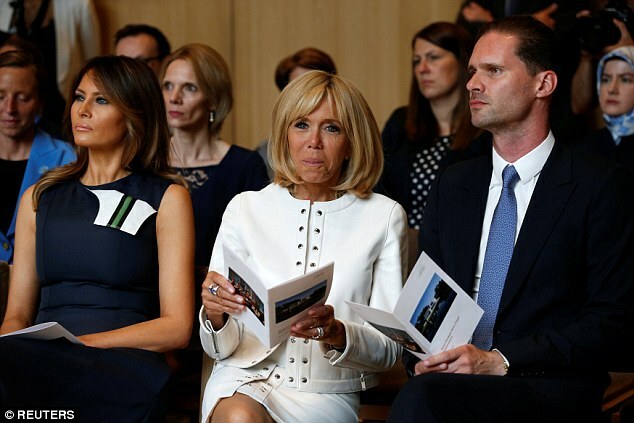 First lady Melania Trump smiled as she took in a concert with French First Lady Brigitte Macron after her husband blew up at a breakfast meeting over Germany at the start of the NATO summit. She put on a broad smile as she was seated next to Macron while her husband met with other world leaders after the tirade – including German chancellor Angela Merkel, who has been the subject of his attacks on defense funding. The former model also was to attend a chocolate tasting and fashion show. Also there was Mojca Stropnik, the first lady of Slovenia, the first lady’s home country.